Jackie Walker is the former Vice-Chair of Britain’s far-left group Momentum who was suspended from the Labour Party due to accusations of antisemitism. 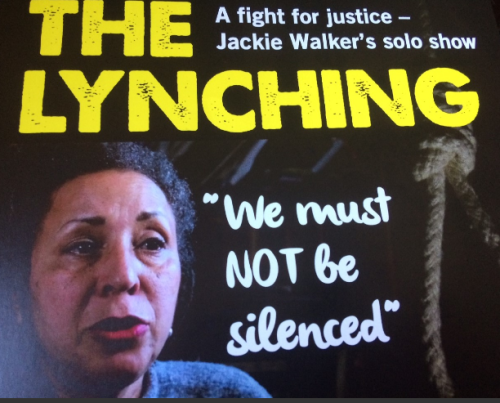 In the Sunday Observer (sister publication of the Guardian), Alexei Sayle lauded Walker’s play “The Lynching”, a theatrical attempt to justify and explain the views that made her controversial. Here’s the full review by Sayle, an author, comedian and anti-Israel activist. Jackie Walker was a Labour activist campaigning for Jeremy Corbyn. Then she was accused of antisemitism, suspended from her party, abused and demonised on TV and the internet. This was her presenting her side of the story. First, there was a whole security rigmarole you had to go through to get tickets for this show, since pro-Israeli activists were trying to disrupt it. This was very exciting but I was still expecting to find little enjoyment in the show itself, seeing it more as an act of political duty. However, it turned out to be a great night. Jackie possesses a lovely singing voice and the honed acting skills of a veteran performer, plus the tragic story of her Jewish civil rights campaigner father and her black Jamaican mother, who was wrongly confined to a mental institution in the US, is worth a show in itself. Jackie is also very funny and frank about her own bolshy nature. Usually, when you hear after a play, before you can escape, somebody announces: “There will now be a discussion about the issues raised in this show” and your heart sinks but in this case the talk afterwards was almost as good as the performance. I saw it too (at SOAS on 13 September – before the performance that Sayle saw at Theatro Technis in London) and I really don’t recognise Sayle’s description. Sayle refers to ‘the tragic story of her Jewish civil rights campaigner father’. Walker claims in the play that her father was called Jack Cohen, an American Jewish jeweller. Odd that in her autobiography there is nothing about him (though an article in the Guardian in 2008 does mention him). There is a mock trial in the play where Walker’s mother defends her. She suggests that Jackie is accused of saying “There’s no such thing as antisemitism” (of course she was never accused of that) and of hating Jews (this was also never an accusation). Walker has stated that ‘Jews were the chief financiers of the slave and sugar trade’. In the play Jackie defends this as talking about her ancestors: Portuguese Jews who had fled and married into her mother’s family. Again – oddly – there is nothing in her book about this. In the post-show discussion at SOAS, Walker suggested that the Jewish Chronicle newspaper was in cahoots with the compliance department of the Labour Party (the unit which deals with disciplinary issues, including accusations of antisemitism) – a nasty innuendo about Jewish power in UK politics. He is a Patron of the Palestine Solidarity Campaign. And (like Walker) he believes that antisemitism in the Labour Party is “fabricated”. Guardian frames expulsion of Iraqi Jews in 40s and 50s as “easygoing, pluralistic prosperity”. Guardian article on BDS includes false claim (later retracted) that U2 supports Israel boycott. Jenni Frazer – ‘Utter, utter rubbish’. Sort of, ‘Made for the UK Guardian’. You wouldn’t be another UK-hating bigot, would you now? Really Stephen is that as well as being the Great Khazi of London’s anti-Semites? You’re more like the Grand Cyclops of the KKK. Gerald as an officially designated National Treasure I get lots of honours bestowed on me. I am not able to remember them all. Stephen you have a typo in your first sentence. As for you receiving lots of honours Stephen there are more that you deserve all of them posthumously and the sooner the better. Memory would be difficult function for a pea-sized brain like yours. Your return here is the first time I’ve ever been sad to see cancer fall out of remission. Sayle, Walker, Corbyn, and the entire British left’s obsession and upside down narrative about the one and only Jewish state is degenerate. Oh dear no. That should read Sayle, Walker, Corbyn, and the entire British radical extreme left’s obsession…….. I have to disagree with you Felix. The extreme left is far from being radical, they are the biggest collection of reactionary conservatives you can find. She thinks very highly of herself. Nobody lynched her. On the other hand, Israelis have been getting purposefully run over and stabbed since October 2015. Also, Israel has been accused of being an Apartheid state when they are not an Apartheid state. It’s the play that is a lynching, as is that stupid video. Oh, and please, when you crush people under your heel, do remember to be kind. That’s the advice from a brainless, talentless, fool wearing pinstripes and a fedora.